Jonathan Newell takes a tour of the Harwin factory in Portsmouth to see the most recent innovations in space and aviation connectors. Portsmouth is a city that has an enviable reputation for providing a base for high technology, innovative companies that serve the IT, aerospace and defence industries and it was here that electronic connection specialist, Harwin chose to locate its base nearly 60 years ago. The company opened its current facility in the north Portsmouth suburb of Farlington in 1963 but only the façade is recognisable from those early days as Harwin has progressed its capabilities over the decades, constantly investing in new manufacturing technology on a 5-year cycle and expanding its facilities to meet the increasing demands for its products. Its latest expansion was the opening of 3,000 square metres of new manufacturing space last year at a cost of £3 million. The result is in increase in floor space of a third over what was previously available, a commitment Harwin made based on the confidence it has in future connectivity and PCB board hardware markets. A significant market for Harwin’s high reliability connectors is the aerospace industry, to which the company supplies its 2mm pitch Datamate and 1.25mm pitch Gecko ranges of connectors, which include the Datamate Mix-Tek series of mixed technology connectors that combine both power and signal cables through one housing. The latest in the range is the Gecko connector, a low-cost, lightweight alternative to the familiar Micro-D connector into which Harwin has invested considerable resources for the development of the range, something which is a normal part of the culture, according to Ben Green, the company’s Head of Marketing, who showed me round the facility. “Our main emphasis is to focus on product development in order to meet the requirements of new markets through innovation,” he told me. It’s clear that a lot of energy has gone into the design of the Gecko, a low-profile, dual row cable-to-board and board-to-board interconnect which saves on both space and weight in applications where such considerations are important. The connectors feature a single piece 4-finger beryllium copper female contact, which can withstand high vibration, shock and extremes of temperature in order to maintain optimum electrical performance and durability under harsh conditions. The Gecko is able to withstand 1,000 mating cycles, can operate at temperatures of -65C to +150C and is rated to withstand 20g vibration and Z axis 100g 6m/s shock, with no discontinuity greater than 1µs. Such specifications have been achieved through an exhaustive process of choosing the correct materials for the product through manufacturing a female connection interface from a single turned piece which has four points of contact rather than the usual three in order to maintain connectivity through such high shock and vibration loads. The connector products offered by Harwin also reflect the company’s philosophy of offering high specification items for high reliability markets at off-the-shelf price rates. The Gecko connector isn’t a MIL spec product but offers the same level of performance whilst being available to purchase commercially. Harwin is keen to ensure that its range of products is available as a generic range, available off-the-shelf and at consistent lead times. It’s now also offering cable attachment and assembly operations to low volume customers so that they have no need to purchase multiple sets of tooling for cable crimping. 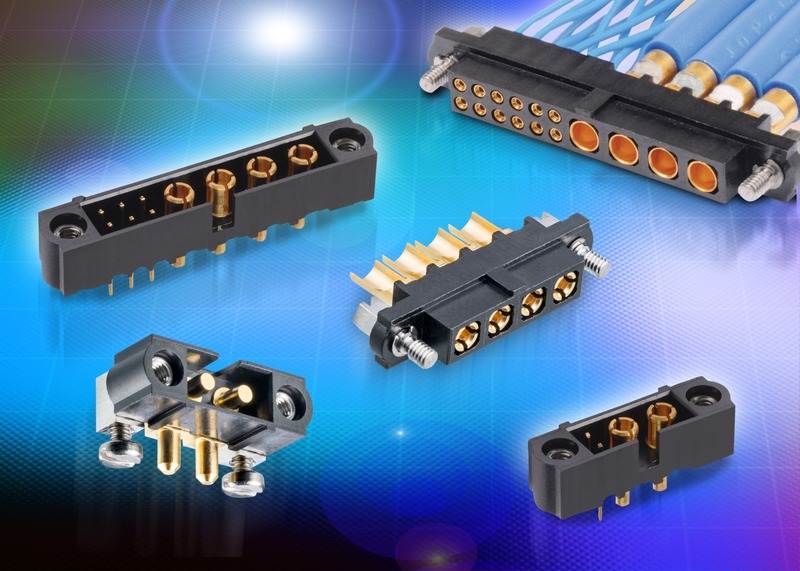 The generic nature of the connectors enables Harwin to do this without producing large numbers of “almost similar” tooling for performing the crimping process. It was clear as Green was showing me around the manufacturing facility that Harwin doesn’t just pay lip-service to investment. The company manufacturers its own tooling both for the crimping performed at its Salem, USA facility and for the manufacturing operations in Portsmouth. 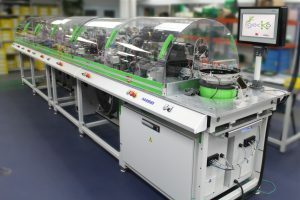 The manufacturing assembly line for the Gecko connector is a dedicated, highly automated process with connected sensor systems for process monitoring as well as item and orientation detection. The assembly line embraces the latest guidelines in Industry 4.0 for fully connected operations. Green pointed out the steps the connectors go through at every stage of the production operation, which doesn’t just assemble the connector from purchased components but fabricates the whole assembly from raw stock, including moulding the plastic parts, turning the wire stock to the correct dimensions and even performing the plating process. Having best practice methods throughout its operations let to the recent EN9100 aerospace accreditation that was awarded to Harwin to add to its existing ISO 9001 certification, all of which helps to extend the company’s reach into other demanding markets. A very promising emerging market for aerospace connectors is in the space industry, which is gaining more accessibility through the use of “cubesats”, according to Green. “At the moment, we’re working with Surrey Space and Warwick University on small cube satellite developments, where reliability, size and weight are the key parameters for components,” he explained. Cubesats are typically 10x10x10cm and are built for either commercial or scientific use and are able to be launched in clusters for fees measured in thousands rather than millions of pounds. The Warwick University Satellite Project (WUSAT) is one such cubesat and is designed to exploit the European Space Agency’s (ESA) “Fly your own satellite” programme. Having already achieved success with launches at altitudes of 30km and 88km, the current phase of WUSAT is to achieve an International Space Station deployment into a low earth orbit at an altitude of 400km. This will include rigorous vibration testing to meet the extreme vibration conditions experienced at launch. At each stage, the satellite’s components and sub-systems must also pass tough environmental test procedures, including thermal extremes and safe operation in a vacuum. With the future looking so promising in such demanding markets, Harwin is continuing to invest in its skills and technology to make sure it will always have a role to play as the aerospace arena continues to expand. With my heritage firmly being in manufacturing, I was fascinated by the “Advanced Manufacturing Research Centre” sign next to a small door in the new building which we passed towards the end of the tour. A glance through the door window revealed a large space with clusters of activity revealing tantalisingly little to the curious onlooker. “The company’s future lies over that threshold,” explained Green as he led me away to conclude the tour.